Scott Lincicome: Is a Recovery Strategy Based on Exports and Manufacturing Jobs Realistic? Is a Recovery Strategy Based on Exports and Manufacturing Jobs Realistic? [T]his new strategy will mean saving more and spending less, reforming our financial system and reducing our long-term deficit. It will also mean a greater emphasis on exports that we can build, produce, and sell all over the world. For America, this is a jobs strategy. Right now, our exports support millions upon millions of well-paying American jobs. Increasing those exports by just a small amount has the potential to create millions more. These are jobs making everything from wind turbines and solar panels to the technology you use every day. The Japan speech was not the first time that Obama mentioned exports as a key to future American job growth. Just two weeks ago at a meeting of his Economic Recovery Advisory Board, he spoke about "export-driven growth, manufacturing growth, growth that pays high wages and provides high living standards for a broad-based middle class." Clearly, exports, and the manufacturing jobs they create, are an integral part of the administration's jobs strategy. But is that a wise approach? The facts seem to say "no." 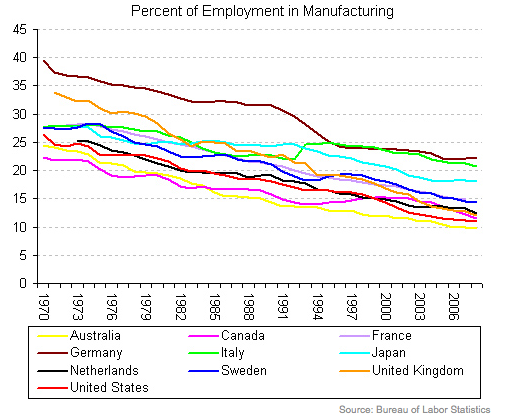 The chart also makes clear that America's "consumption culture" can't be blamed for the loss of manufacturing jobs. According to the CIA's World Factbook, Germany, the United States, Japan, Italy, France, the Netherlands and the UK are all among the world's top ten merchandise exporters; according to the OECD, some are net importers, and others are net exporters. Yet the long-term employment trend for each country is decidedly downward (but for a few random upticks). So neither a country's total exports output nor its trade balance is a magical recipe for increasing - or even retaining - manufacturing jobs. [A]n undervalued yuan neither increases nor decreases aggregate demand in the United States. Rather, it leads to a compositional shift in U.S. production, away from U.S. exporters and import-competing firms toward the firms that benefit from Chinese capital flows. Thus, it is expected to have no medium or long run effect on aggregate U.S. employment or unemployment. As evidence, one can consider that the U.S. had a historically large and growing trade deficit throughout the 1990s at a time when unemployment reached a three-decade low. However, the gains and losses in employment and production caused by the trade deficit will not be dispersed evenly across regions and sectors of the economy: on balance, some areas will gain while others will lose. And by shifting the composition of U.S. output to a higher capital base, the size of the economy would be larger in the long run as a result of the capital inflow/trade deficit. In other words, altering the trade deficit would not affect employment and might actually lead to a decrease in GDP. Third, and before any of you start shouting that it's the nefarious China that's stealing all of those good-paying manufacturing jobs, they're bleeding these jobs too! According to a recent op-ed by GMU's Walter Williams, China has lost over 4.5 million manufacturing jobs since 2000 - a lot more, by the way, than the United States (about 3.3 million, according to the BLS). Williams helpfully adds, "In fact, nine of the top 10 manufacturing countries, which produce 75 percent of the world's manufacturing output (the U.S., Japan, Germany, China, Britain, France, Italy, Korea, Canada, and Mexico), have lost manufacturing jobs but their manufacturing output has risen." According to a report given by Dr. William Strauss, senior economist for the Federal Reserve Bank of Chicago, titled "Is U.S. Losing Its Manufacturing Base?" the answer is no. In each of the past 60 years, U.S. manufacturing output growth has averaged 4 percent and productivity growth has averaged 3 percent. Manufacturing is going through the same process as agriculture. In 1900, 41 percent of American workers were employed in agriculture; today, only 2 percent are and agricultural output is greater. In 1940, 35 percent of workers were employed in manufacturing jobs; today, it's about 10 percent. Again, because of huge productivity gains, manufacturing output is greater. Since the beginning of the current recession in December 2007, the United States has lost 8.2 million jobs. And while I appreciate (really!) the White House's newfound attention to exports (and, by extension, international trade), all of the above data strongly caution against a modern US jobs program that is based, in whole or significant part, upon boosting manufacturing exports. To add millions of jobs under such a plan would defy almost all recent economic experience - in developed, developing, consuming and exporting countries alike. So I sure hope the President and his crack team of economic geniuses have more up their sleeves than a strategy of "exports, manufacturing, and wind turbines." Because it sure looks like they're gonna need it.